Each year, approximately 16,000 people are murdered in the United States. 7% of the killers are female. Who are these women and what drives them to kill? Oxygen’s hit true crime series, Snapped, profiles the fascinating cases of women accused of murder. Did they really do it? And, if they did, why? Whether the motivation was revenge against a cheating husband, the promise of a hefty insurance payoff, or putting an end to years of abuse, the reasons are as varied as the women themselves. From socialites to secretaries, female killers share one thing in common: at some point, they all snapped. 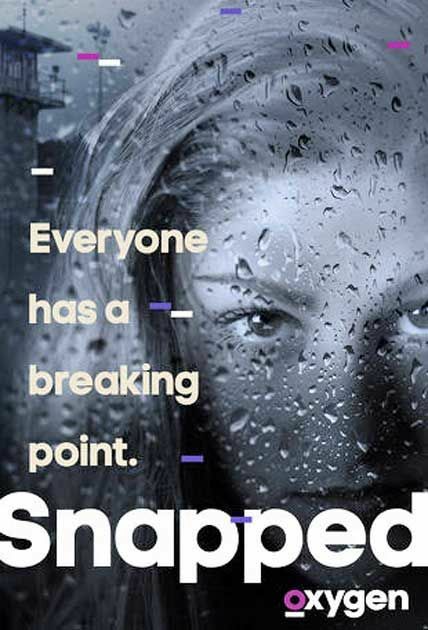 Snapped is produced in conjunction with Jupiter Entertainment, the creators of City Confidential and Dominick Dunne’s Power, Privilege & Justice, and narrated by veteran news reporter Sharon Martin. Each episode of Snapped chronicles the life of a woman who has been charged with murder. These shocking but true stories turn common assumptions about crime and criminals upside down, and prove that even the most unlikely suspects can be capable of murder. After a home invasion in Ohio leaves a corrections officer dead, investigators use controlled calls and an undercover sting at a motel to solve the case and expose a cruel plot with a bloody ending. An investigation into the disappearance of an Arkansas couple leads a law enforcement team on a manhunt through the rugged terrain of the Ozarks and into unforeseen danger. When a revered fire lieutenant is gunned down in his driveway, detectives navigate stories of a long-standing neighborhood feud and a surprise cancer scare to piece together a conspiracy plot involving young pawns manipulated by a cunning mastermind. Alisha Noel-Murray in a panic calls 911 stating that she believes that there is an active shooter in her home and her husband may have been a victim. When police searching for a missing Indiana man discover a body on a riverbank, they launch an investigation that unearths a surprising story of an open marriage and evidence of a brutal torture. Police in a small Pennsylvania town respond to an eyewitness report of a murder behind a grocery store and find that the victim is no stranger to law enforcement. One Response to this entry.